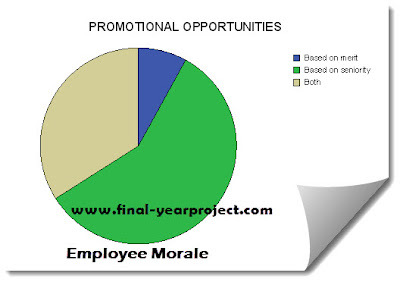 This is MBA final year project report on "study on employee morale in Deekay Exports Limited" and is determined to view the level of morale that prevails in the organization. Morale is the attitude of mind or state of mind of employees, which has impact on the individual and company goals and the purposes. You can also Subscribe to FINAL YEAR PROJECT'S by Email for more such projects and seminar. Objective of the study are to find the level of employee morale in DeeKay Exports limited, to find the expectation of employees towards job, work environment and financial benefits, to know about the Employee Satisfaction, to know the interrelationship between supervisors and employees, to know about the safety and welfare measures provided to employees.